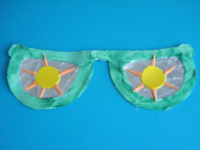 A craft that will bring the sun indoors! 1. Gather your material. 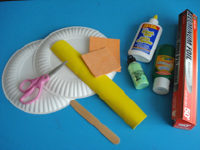 You will need two paper plates, a piece of yellow Fun Foam, a piece of orange Fun Foam, finger paint, glitter, aluminum paper, scissors, a Popsicle stick, and white and/or hot glue. 2. Place both paper plates one on top of the other. 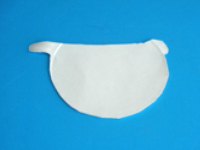 Cut one side of your sunglasses' frame, leaving a small section in the upper inner corner (for the bridge) as shown. 3. 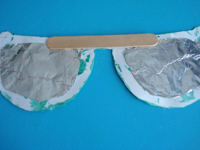 Separate the paper plates and glue both sides of the frame together, joining both sections that will form the bridge (part over the nose) of your sunglasses. 4. 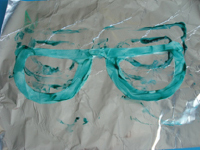 Spread a piece of aluminum paper on your table to protect it and pour a few drops of finger paint on the frame. With your fingers, spread the paint all over. 5. Sprinkle the frame with glitter. 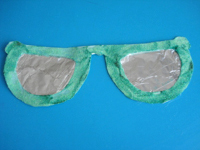 Shake it over the aluminum paper so that any excess glitter will fall off. 6. 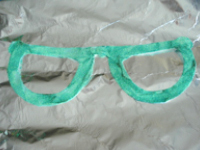 Set your frame on a clean piece of aluminum paper and trace the inside of the frame (glasses). 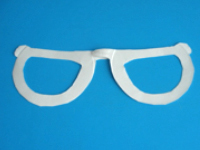 Cut out both shapes, adding a few centimetres all the way around so you can glue them behind the frame. 7. Cut two small circles out of the yellow Fun Foam to represent the sun's reflection. Glue them on the glasses. 8. 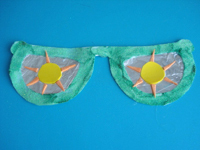 Cut several tiny triangles out of the orange Fun Foam and glue them around the yellow circles to represent the sun's rays. 9. Glue a Popsicle stick under the frame, near the top, for sturdiness. 10. 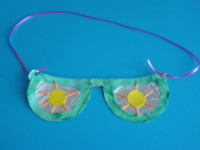 Display your giant sunglasses on a wall or attach a piece of ribbon to either side of the frame so children can wear them around their neck or hang them from the ceiling. Photograph children holding their giant sunglasses in front of their face.